Andrew Unsworth, one of three full-time organists of the Mormon Tabernacle, plays the Kenneth Jones & Associates organ built in Bray, Ireland in 1992 for the Cathedral of the Madeleine, Roman Catholic, in Salt Lake City. The organ has 4,066 pipes, 79 ranks, 4 manuals and pedal, and mechanical key action. Here is a blockbuster recital performed with great aplomb and musicianship. The organ sounds magniﬁcent thanks to a lively acoustic and exquisite voicing, and Andrew clearly relishes the opportunities that are afforded him. His playing is clean, intensely musical, and fearless. His organ management is ﬂawless and his technique breathtaking. My congratulations to all concerned with this project [and] . . . authoritative performance. Marcel Dupré, a native of Rouen, France, was one of the best traveled and most celebrated organists of the twentieth century. He served as the organist at the church of St. Sulpice in Paris and taught at the Paris Conservatory. Dupré wrote his Prelude and Fugue in B Major in 1911, and, upon its publication in 1920, he dedicated it to René Vierne, an organist who had been killed in World War I. The prelude couches a heroic melody in a context of a toccata figuration reminiscent of the pealing of bells. The fugue subject picks up on the quartal motif introduced in the prelude. At its climax, the subject returns with a canon in augmentation, and the work closes gloriously with figuration reminiscent of the prelude. Jehan Alain was born in Saint-Germain-en-Laye, a suburb of Paris, into a family of musicians. He attended the Paris Conservatory, where he studied organ with Marcel Dupré and composition with Paul Dukas and Jean Roger-Ducasse. He was considered one of Frances brightest, young musicians, but, tragically, was killed at the Battle of Saumur in 1940. Alain was intrigued by a melody attributed (falsely, it turns out) to Clément Janequin and with an unusual cadential melodic figure. Alains Variations of 1937 explore the modal ambiguity implied by the chromaticism of this cadential motive, and they are more freely structured than a typical variation set. Here, the composer calls for several characteristic French organ colors, including Flûte, Hautbois, and Cromorne. Revered composer, organist, and improviser, César Franck was born in Liège, Belgium, but lived the bulk of his life in Paris. He served for many years as the organist at the church of St. Clotilde in Paris and as professor of organ at the Paris Conservatoire. Francks Fantaisie in A is from his Trois Pièces, a set of compositions premiered at a recital he performed at Pariss Trocadero for the 1878 Universal Exposition. The piece is very symphonic in conception, scale, and style, exploring a wide range of colors, dynamics, and textures on the organ. The famous German organist and composer, J. S. Bach, encountered the concerti of Antonio Vivaldi in 1713 when he was working as a court musician in Weimar. 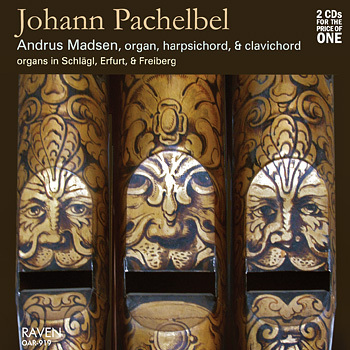 Bach made transcriptions for organ of several of these works, certainly to perform them, but also as a way of studying this music. According to Bachs biographer Forkel, Vivaldis concerti taught him [Bach] how to think musically. Bachs encounter with Vivaldis compositional style is apparent in the Prelude and Fugue in G Major in the lively, triadic motives, the alternation of soli/tutti textures, and the use of harmonic and melodic sequences, among other features. At the end of the Fugue, Bach overlays the subject on itself, a contrapuntal device called stretto. Böhm spent most of his career as the organist at the Johanneskirche in Lüneburg, the same city where the young J. S. Bach attended school 1700-1702. While it is possible that Böhm was Bachs first organ teacher (and Bach scholar Christoph Wolff has recently discovered new evidence that Bach was a student of Böhm and may even have lived in Böhms house), there is no doubt that Bach admired and studied Böhms music. In this setting of the chorale Christ lag in Todesbanden composed by Böhm, each phrase of the melody is introduced contrapuntally before it is played by a solo color, with plenty of added ornamentation. The work concludes with a florid setting of the final Alleluia. Maurice Duruflé spent the majority of his career as organist at the church of St. Etienne du Mont in Paris. A lover of Gregorian chant, Duruflés compositional style was heavily influenced by the modality, shape, and fluidity of chant melodies. In the Prelude, Duruflé creates a flowing texture, drawing inspiration for his motives from the chant tune. The composer delays the appearance of the theme in a readily- recognizable form until the serenely beautiful Adagio. Then the work concludes with a series of variations in which Veni Creator is plainly stated, couched in a variety of textures and colors, culminating in a triumphant toccata. Educated at the Paris Conservatoire as a student of César Franck and Charles-Marie Widor, Louis Vierne served from 1900 to 1937 as the organist at Pariss Notre Dame Cathedral. The Berceuse is from his 24 Pièces en style libre (1913), a set of character pieces modeled to some degree after J. S. Bachs Well-tempered Clavier in that each piece is in a different key, rising successively through the major and minor tonalities. Vierne designated these pieces to be played by either organ or harmonium (reed organ). Viernes Berceuse is based on a French childrens song, and it is dedicated to his daughter, Colette. Felix Mendelssohn wrote his War March of Priests (Kriegsmarsch der Priester) for orchestra, to be performed as incidental music to Jean Racines drama, Athalie. It was arranged for organ by W. T. Best (1826-1897), organist at Englands Liverpool Town Hall, who was a very prolific transcriber of choral and orchestral repertoire. The War March has great melodic and rhythmic appeal, and it was a very popular 19th-century organ recital piece in England and the US. Andrew E. Unsworth is one of three full-time organists at the Mormon Tabernacle in Salt Lake City, where he participates in the daily recital series on the 206-rank Æolian-Skinner organ and accompanies the Mormon Tabernacle Choir on their weekly radio and television broadcast, Music and the Spoken Word. Prior to this appointment, he served as an Assistant Professor of Music at Stephen F. Austin State University, in Nacogdoches, Texas, and as Organist and Assistant Director of Music at the Cathedral of the Madeleine. Andrew received his Bachelor of Music degree from Brigham Young University in organ performance and pedagogy and then pursued graduate studies in historical performance practice at Duke University, which awarded him the Master of Arts and Doctor of Philosophy degrees. He has performed throughout the United States and Europe as a soloist and accompanist and was a recitalist at national and regional conventions of the Organ Historical Society and American Guild of Organists. Andrew has also written articles on organ performance and teaching in nineteenth-century America for The Organ Yearbook, The American Organist, The Encyclopedia of the Organ, and The Tracker. He has served as a member of the Organ Historical Societys Publications Governing Board. Andrew holds the Associateship Certificate of the American Guild of Organists, which also awarded him the S. Lewis Elmer award. Andrew and his wife Alison are the parents of five children. The first organ of the Cathedral of the Madeleine in Salt Lake City was a 27-rank electro-pneumatic instrument built and installed by the Kimball Company of Chicago in 1909. This instrument was rebuilt and enlarged by Schoenstein and Co. of San Francisco in 1953. By the mid-1980s, the organ had fallen into a state of disrepair and was replaced in 1992 by a new 79-rank mechanical-action organ built by Kenneth Jones and Associates of Bray, Ireland. Twelve ranks of pipes from the original cathedral organ have been restored and incorporated into the new organ, which contains a total of 4,066 pipes. The new organ was used liturgically for the first time during the Cathedrals Mass of Dedication on February 21, 1993. The inaugural recital performed by David Higgs took place on May 21, 1993. The organ was donated by the George S. and Dolores Doré Eccles Foundation. Since 1994, the Eccles Organ Festival presents five organ concerts annually as played by renowned organists. Writes Pipedreams host Michael Barone: "Sublime!! . . . marvelous performances."